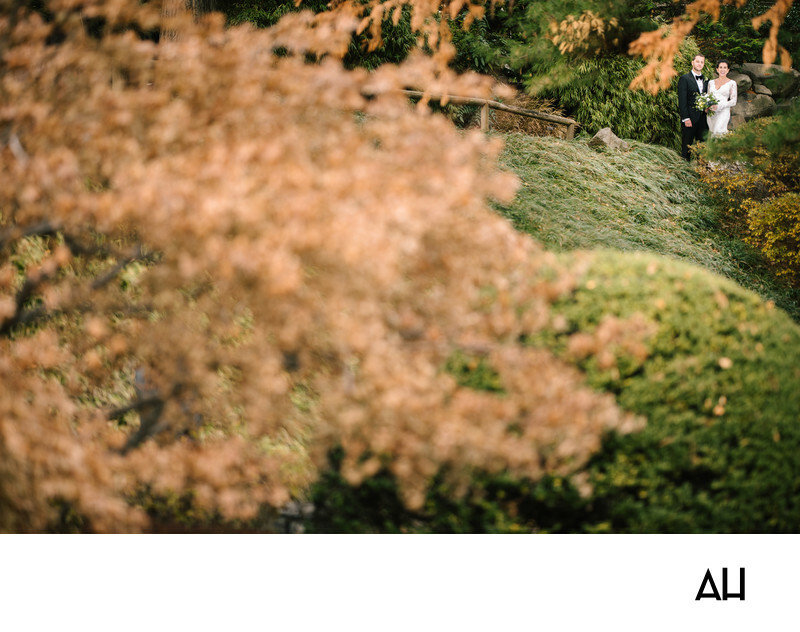 The Brooklyn Botanical Garden has hosted the weddings of New Yorkers for decades. It’s one of my favorite places to shoot wedding photos in the city, with dozens of corners providing a wide range of photo backdrops. From the Japanese Hill-and-Pond Garden and Native Flora Garden, to the Shakespeare Garden and Fragrance Garden, there are always plants in bloom, no matter the time of year. The location features two separate event buildings – both with beautiful windows to let in the light and greenery. The larger of the two, Palm House, looks like a gilded era greenhouse with it’s all-glass exterior and ornate architectural details. It seats up to 275 guests, and when couples reserve the Palm House, they also get access to the adjoining outdoor areas. The garden space is lovely for an outdoor ceremony. And the outdoor patio space surrounds a tranquil lily pond, adding extra interest to the setting. The Atrium is slightly smaller, with seating for 130. Its design is modern and minimalist, but the expansive windows still bring the outdoors in. The cherry esplanade just outside, provides especially spectacular views during the early spring cherry blossom season. As with the Palm House, couples who reserve the Atrium also have access to an outdoor garden space suitable for a ceremony. Patina Events caters all wedding receptions at the venue, and brides regularly post high ratings for both the food service, and the Brooklyn Botanical Garden event staff. There is another option for couples looking for a simple, intimate ceremony space – the Botanical Garden allows couples to plan morning ceremonies at 9am – before public visitors begin arriving. Another way to take advantage of the garden’s rich scenery, is to plan an engagement or wedding photo session. Permits are required. Drop me a note if you are interested in learning more about photos at the Brooklyn Botanical Garden.